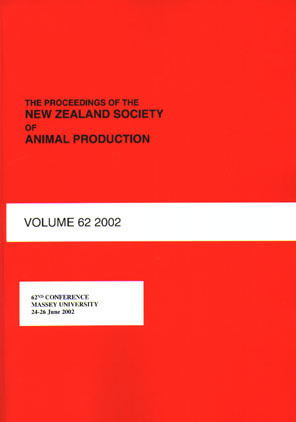 New Zealand ruminant livestock production is largely pasture-based and aligned to seasonal pasture supply. Despite pasture providing a complete diet for grazing pregnant ewes when fed in sufficient quantities, there is a growing trend for farmers to use supplementary feeds to maintain production in times of feed shortages such as during winter, or to facilitate increased stocking rates (McCoard et al. 2015). Due to its high dry matter (DM) yield, and low cost per unit of feed, compared to other supplementary feeds (Gibbs et al. 2015), fodder beet (FB: Beta vulgaris) is a winter feed option. Fodder beet is characterised by its high sugar (energy rich) and low nitrogen (N) contents and although live weight (LWT) responses in finishing beef cattle fed FB have been measured (Gibbs et al. 2015), there is less knowledge on the nutrient-supply profile and performance of offspring when fed to pregnant animals. Knowledge of potential nutritional deficiencies, and the implications for the pregnant ewe and her offspring are essential in order to develop feeding recommendations for farmers. The objective of this study was to determine the effects of feeding FB vs. ryegrass dominant pasture (RG), to ewes in mid-to-late gestation, on offspring performance through the measurement of lamb size, rectal temperature and pre-weaning growth.